The second week of March, I received a call from a political organization. They asked if I’d be willing to be a handler for a VIP in conservative circles. Why me? Because I’m Libertarian and seen as neutral — not Democrat — and they can’t find anyone else on short notice. At least they were honest. A series of quick phone calls later and I was talking with this former lawmaker. It gets more bizarre. It’s about 5 p.m. in the afternoon and he’s all over the place, talking about his farm, organic food, and election reform for about an hour. Then he states that he’s heard that I’m well connected at the Georgia capitol and that I’m the right guy for the job. I tried to interject that I know my way around the capitol, and maybe a few legislative members, but before I could say much more, he informs me that the Trump 2020 National Security & Cybersecurity adviser Lt Col Tony Shaffer, ex MI, Spy, etc. is arriving at the Atlanta airport 8:30 a.m. the next morning. I’ve been asked to introduce the Lt. Col. to Georgia house members and peel off as many votes as possible to defeat HB 316, which is the unsecure and costly touchscreen voting equipment bill. At that very moment I recall this Richard Branson meme, that goes something like this: “Say ‘Yes’ to an amazing opportunity and then figure out how to do it later.” Well, I didn’t know what this was, but I said, “Yes, I’ll do it.” It’s about 6:00 p.m. and the Lt Col arrives in 15 hours. OK, now the “figure it out” part. I called around to various people and floated tons of ideas about how to to do this. Should I try to set up appointments, a press conference, TV news interviews? So, I picked up the Lt. Col. the next morning at 8:30 a.m. with no real agenda other than drive to the capitol and talk to any legislative members we find. We hit it off. We’re both Army. We discovered we both participated in REFORGER military exercises in Germany in 1985. A few jokes were cracked and I kind of let him know to lower his expectations because we didn’t have much time to plan. He was like “Sure, No problem!” then he tells me another spy story. We arrived at the capitol and it was crossover day. I started talking to aides and they told us that members were captive today and to work the rope lines. We did. It was just the beginning of what turned into a phenomenal success. Fast forward. We were talking to GOP Senate leadership in their offices, having an in-depth conversations about cybersecurity and voting. Lt Col Shaffer was educating them, relaying the message that President Trump has endorsed paper ballots and that he, Lt. Col. Shaffer, is advising the Trump 2020 campaign to endorse hand-marked paper ballots. The LT. Col. recommended not supporting the technology in HB 316. We spent 3-4 hours in their offices over 2.5 days. Not only did they not want to hear what we were saying, but they were extremely frustrated. Rightfully so, because this was happening so late in the legislative session. Unfortunately, the Lt. Col. didn’t know about HB 316 until just a few days prior to his visit. The Senate Democrats were curious. After introducing Lt. Col. Shaffer to the Democrats, I learned that 3-4 were potentially wavering on voting in favor of HB 316. I approached them about voting as a block against HB 316, pointing out that it could be effective. To my surprise, they met as a caucus the next morning and voted to oppose the bill. At the same time, I found out that the Republicans are wondering who is this Libertarian guy and former Secretary of State candidate is? Over the next 72 hours, myself, the Lt. Col., and many others energized the Democrats. For Wednesday’s floor debate in the Senate, the Democrats showed up ready for a fight. There was no doubt the Democrats knocked the Republicans on their heels and cleaned their clocks. Hands down, the Democrats won the debate. Sen. Elena Parent was especially effective. Unlike the GOP opposition, she put in the effort to learn the issues and it showed. Later that day, I received a few evil-eye looks from legislative aides. Unfortunately, the momentum started at the end and we ran out of time. Had we discovered Lt. Col. Shaffer even three weeks earlier, it may have been a different outcome. In a truly sad day for American-style representative government, the vote for the next generation of voting equipment has been decided along party lines. 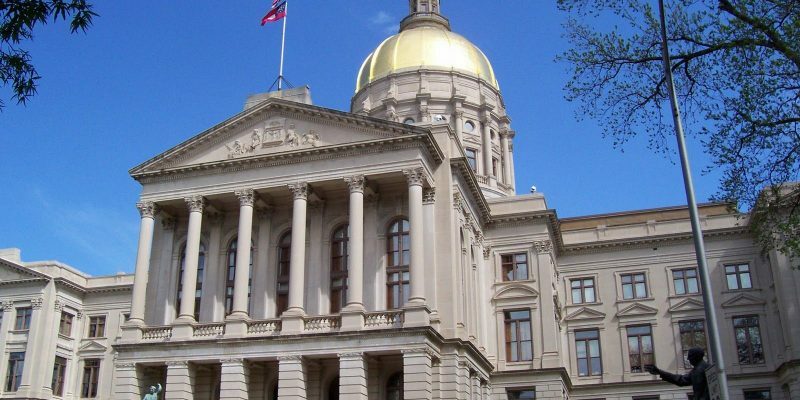 The good news is the Libertarian Party of Georgia got a ton of exposure this week in front of lawmakers and in the Twitter-sphere. We, along with the voting activist community, provided leadership with regards to this huge decision. We were recognized privately by members of both parties for significantly impacting the conversation and I count that as a success.